All of my romaine lettuce plants are bolting in the heat. That means that the plants which used to be fat and lush, suddenly shoot up into the air, looking like miniature trees. I tasted some of the leaves on the ‘trees’ and they tasted fine, so I cut off all the bolting parts of the plants, harvested the leaves and brought them in. I couldn’t know less about what I’m doing, but the rest of each plant still looked pretty good, so I’m hoping there are good leaves to harvest later. Time will tell. 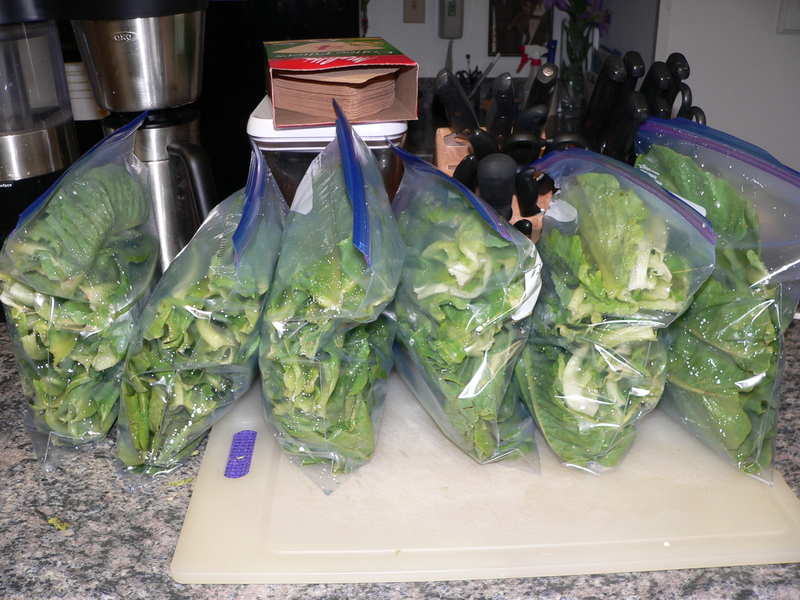 I brought in a big basket of the best leaves, dumped them into the sink so I could get them clean, and then stored them in gallon bags and put them in the fridge. We’ll have some in our salad with dinner this evening. The sun is so hot I was really shot when I brought the leaves in. I let them soak in the sink while I rested and gulped water. I cooled off and then washed and stored the leaves, then rested again! I just came in from scrubbing and refilling Amber’s pool. I use my husband’s car washing broom. It works just fine to clean without hurting the plastic of the pool. I loosen everything, drain about half the water out, then use the broom again, then dump the rest of the water out. Then I spray the pool out and leave the hose in the pool, held down by two bricks, to fill it. When it was about half full, Amber came bounding around the house, looked at me, and then jumped right into the pool. She walked around, drank some of the water, then laid down full length in the water. I could almost hear her say, “Ahhhh!” as she gave me a very satisfied look. She got out, shook water all over me, then started barking at the hose. When I laughed, she jumped into the pool again and luxuriated some more. I finally finished filling the pool and put everything away. Amber is snoring on her bed in the living room now. At dusk, my husband and I will do our first pass at cutting back the greenery on the sides of the driveway. I’ll put our battery-powered weed eater in the back and my sunglasses that wrap around, and my gloves, so that when we get to the bottom, we can do some weed whacking and pruning. Then we’ll go slowly up the other side of the driveway, cutting things back as we go, and we’ll be finished for the day. Our driveway is long and steep – about 650 feet, so this will take several passes to get it the way it should be. I hope that you’ve had a wonderful day, too.